Good news for everyone! Our prime minister Narendra Modi has changed and modified the LPG gas subsidy scheme recently. Let’s know what are the new rules and regulations for LPG gas subsidy. LPG Gas Subsidy (PAHEL) is now one of the best subsidy scheme in india, closing doors of bribe and corruption. 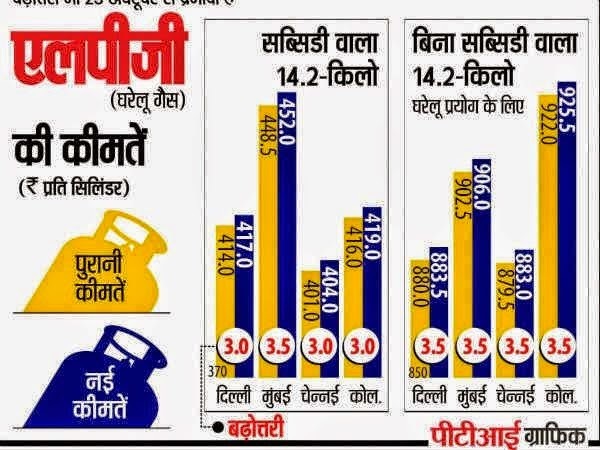 Update :- The "Pahal" Gas Subsidy scheme started by Narendra Modi Government is now recorded in Guinness book of records for the Largest Cash Transfer Programme. Update - The Last date to apply for LPG Subsidy (1st July, 2015) is over now. Old connections will not get lpg subsidy now, now you need to apply for fresh connection to get LPG Subsidy. Sonia Gandhi announced to transfer subsidy direct in customer’s bank account. Moreover, she declared that you will compulsory need Aadhar Card for that. Now, Prime Minister Narendra modi’s office has fixed the subsidy on domestic LPG gas at 568 Rs per cylinder. However, the Prime minister’s office has decided not to change the consumer price till current fiscal year ending March 2015. Furthermore, during the meeting at PMO office the subsidy for domestic LPG has been set to 568 rs per cylinder of 14.2 kg. In addition, it will be common between government and public sector upstream oil companies Oil & Natural Gas Corporation, GAIL India, and Oil India Limited. Before the changes in LPG gas subsidy, you can not get the subsidy without Aadhar Card. Now, you can get the advantage through modified direct benefit transfer scheme. In addition, now bank account is necessary but aadhar card is not required to get the subsidy. According to the new rule for LPG gas subsidy, you will get two options. First one is that if you have your Aadhar card then link the Aadhar number with your bank account. Second one is, if you don’t have the Aadhar card then just link your bank account number. Who will get the benefit of LPG gas subsidy easily? This scheme will be launched from 15th November 2014. Customers who have not joined the scheme will get duration of three months to join the scheme. In the duration of three months you will have to complete the bank account or Aadhar card process. Moreover, after you have joined the scheme you will get the benefit of subsidy of three month as well. It will be transferred to your bank account directly. Update :- Aadhar card is not compulsory to get LPG Subsidy, there are some news that some dealers demand Aadhaar card to provide LPG Subsidy. Please concern Supreme court order, where SC said that Aadhaar Card is not compulsory to get Subsidy. Total 1,50,000+ people has left LPG Subsidy scheme voluntary and now buying LPG Gas Cylinder on market price. What are you waiting for? Don’t waste your time and just join the modified direct benefit transfer scheme for LPG gas subsidy. Good luck!